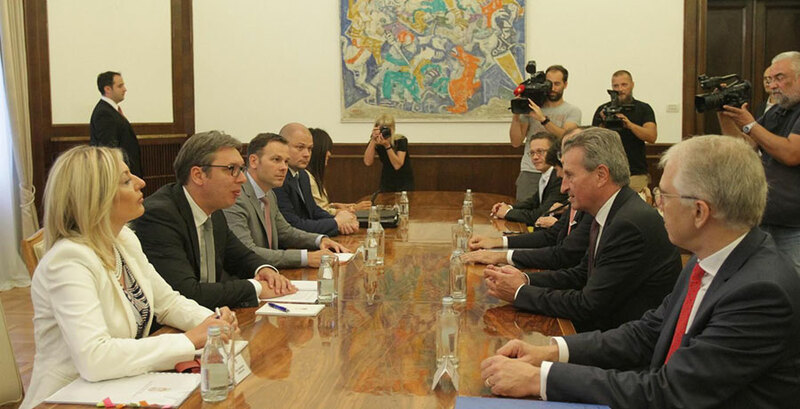 “We have good relations and, regardless of a number of challenges and obstacles, Serbia is making continued progress on the EU path with the utmost support from the EU,” said Oettinger. “Serbia is ready to seize the positive momentum created by the European Commission’s strategic document on credible enlargement perspective for the Western Balkans,” Serbian President said. Vucic described the new EU budget proposal as “a fine example which one should look upon,” referring in particular to the elements dealing with investments in innovation, infrastructure and agriculture, reads a statement released from the President’s Cabinet. Vucic believes present EU budget proposal is “extremely important” as it envisages a considerable increase in pre-accession assistance for candidate and potential candidate countries. He expects “the European Commission to provide stronger support so as to speed up the accession talks” noting that the EC’s Report “clearly states that Serbia is implementing numerous political and economic reforms.” Serbian President said Serbia was ready to “get down to further reform,” in line with assessments and recommendations laid out in EC’s Report.